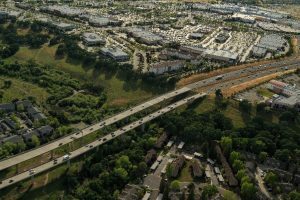 If you live in Roseville, Rocklin, or Lincoln, then you most likely have been stuck in traffic on Highway 65, a major north-south connector through the western part of the Placer region. Placer residents traveling to the Roseville Galleria or the restaurants and other shops along the corridor know all too well the bumper-to-bumper traffic conditions that typically come with enjoying a day or evening out at one of the many exciting destinations along Highway 65. Placer County Transportation Planning Agency (PCTPA) is spearheading a multi-jurisdictional project team to improve the gridlock and maintain a safe travel experience on this heavily used highway. The State Route 65 Widening Project is a partnership with PCTPA, the cities of Roseville, Rocklin, and Lincoln, Placer County and Caltrans. It will add an additional travel lane in each direction between I-80 and Blue Oaks Boulevard. The project also includes operational traffic improvements north of Blue Oaks Boulevard to the City of Lincoln. In addition to being a major corridor for shopping and entertainment, SR 65 is also identified as one of the three major regional job centers in SACOG’s Metropolitan Transportation Plan, the six-county region’s 20-year plan for transportation improvements based upon projections for growth in population, housing and jobs. Traffic congestion extends the commute time for employees and significantly delays goods movement. Caltrans, in cooperation with PCTPA, has prepared an Environmental Initial Study/Mitigated Negative Declaration (IS/MND) for the project. The draft IS/MND is now available for public review, and the public has 30 days to review and comment on the findings in the document. PCTPA is hosting a public hearing to discuss the proposed project on Wednesday, May 24, 2017 at 9:00 a.m. at the Placer County Board of Supervisors Chambers located at 175 Fulweiler Avenue, Auburn, CA. Visit the project website to learn more and sign up for email updates.